click to join our Meetup! Kayak polo is fun. Paddling skill improves fast. Kayak polo is an exciting and fun way to meet friendly people, and improve paddling skills. We welcome men and women all skill levels--beginners included. We can provide gear to newbies, and help with instruction. Most of us were new to paddling when we became a club, about 2004. Because skills improve fast with polo, some of us were competing successfully in tournaments within two years. Others preferred it just for fun and good exercise. 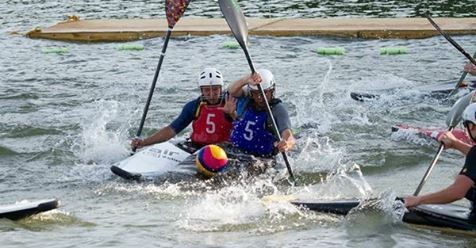 It's a small sport in the USA, but popular in Europe, where it's called canoe polo. Strategy is a bit like basketball, a bit like soccer. Games are short (two 10-minute halves). We play several per session. Games are on Sundays. Most sessions start at 1:00. We move to mornings when it's hot, indoors when it's cold. Check with us for time and location.